I have been absent from the blogging world for a while, having taken a break after the birth of my beautiful baby girl. (By the way, you can get adorable headbands like hers from Rich in Blessings). I've also been working on compiling my graduate portfolio for my Masters of Education degree--talk about a huge project! It's finally almost done; I just submitted the last part of my rough draft, and the final project is due in a week, and then I am FINISHED with school! You know, I have been working full time while being a full-time student for years now. This past year I was a full-time graduate student, a full-time teacher with a self-contained classroom (meaning I taught all subjects, which takes a lot of planning and grading), and I was pregnant the entire school year--literally; I got pregnant in September and had Baby Girl in June. So after wading through this past year with that crazy schedule, plus the morning sickness and fatigue and all, and still somehow managing to also make everything for Baby's nursery, I thought surely this one course I had left to take this summer wouldn't be a big deal. Yes, I knew when I enrolled that I would have a newborn, but it was my last course to get my Master's degree, and surely if I could handle all that other stuff I could handle one little course and a baby......ha! Yeah, right! Well, okay, I obviously handled it, because I'm here at the finish line, but let's just say I don't recommend it. I mean, I'm so glad that I will finally have the degree, and that I didn't put it off, but this summer has not exactly been easy. I've had time for very little else, let alone crafting and blogging. Thank goodness for my amazing husband who has picked up so much of my slack around here lately. When we had our 20 week sonogram appointment, we had the doctor call my brother-in-law and tell him the baby's gender while we waited in the other room. Then we had to wait for the longest week and a half of my life until we were able to travel back to our hometown for the party. But it was really fun and well worth it! They rented out the local community center for the party and decorated it so cutely! Refreshment table--everything pink and blue! Everyone received a coin when they arrived, and put it in one of the buckets to place their vote for girl or boy. Hubby and I stopped at Pops and got some pink and blue pop for the occasion. You can also get vintage soda pop from Amazon. Everyone dressed in pink or blue, for Team Girl or Team Boy. Hubby and I also bought these ridiculous hats just for the heck of it. We played a game based on old wives tales, in which I was asked questions about my pregnancy, and a tally was added to either the boy column or the girl column depending on my answer. Finally, just when I thought I couldn't stand it any longer, we arrived at the actual reveal. 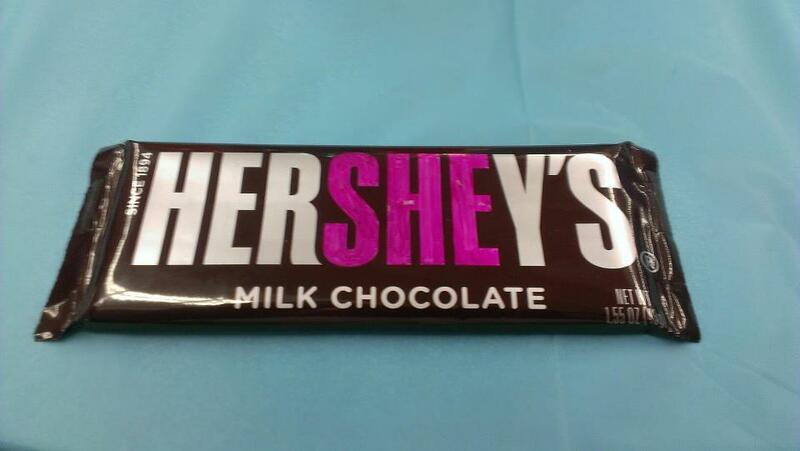 Everyone was handed a Hershey's chocolate bar wrapped in plain paper and asked to decorate it for us. After everyone had decorated the wrappers, my soon-to-be sister-in-law announced that one of the candy bars had the answer inside it. She told everyone to unwrap their candy bars at once, and that whoever had *the* candy bar needed to shout it out. It was a really special moment as we were able to find this out with all of our family and friends. Now, they rigged it so that we would be the ones to open the candy bar, but it would also be fun to let a random guest open it and shout it out, which was my sister-in-law's original plan. Unfortunately in our family, we just couldn't trust that to happen. As it was, we had people quickly coloring in just the "HE" on their bars and shouting out that theirs said "HE" and there was a discrepancy. Lol--you gotta love family! All in all, this was a very memorable day. I am thankful to my brother- and sister-in-law for all the work they put into planning, and that we got to celebrate our news with friends and family. To anyone who is considering having a reveal party, I highly recommend it!